From 8 – 10 p.m., on Oct. 30, in building C of the Cameron Village, Cameron’s Program Activities Council (PAC) and Student Housing department hosted their second annual haunted house, open to the community. 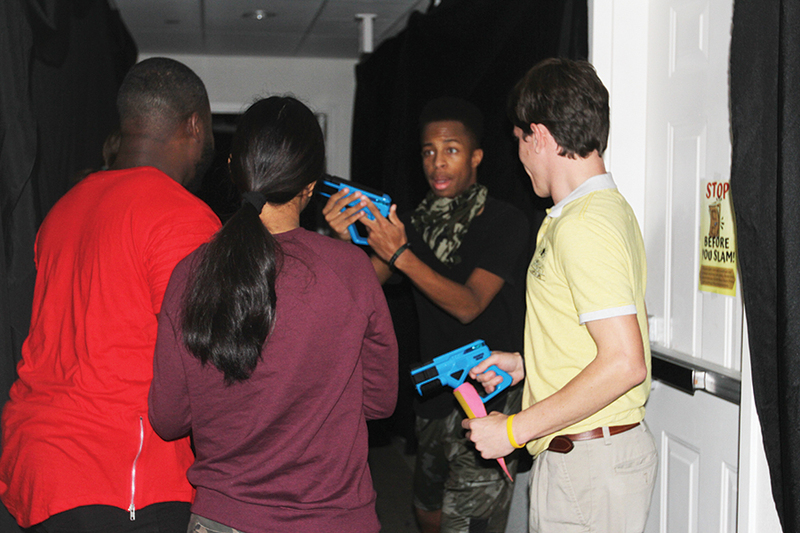 The haunted house took place on two floors and featured interactive games involving laser tag, capture the flag and zombies, portrayed by Student Housing Resident Assistants (R.A.s) and members of PAC. As participants arrived to each floor, an informant provided them with instructions and laser guns, encouraging them to “kill” the zombies to find the hidden flag and return it back to the informant. Student Housing Hall Director Alexandria Knight said, despite the other organizations on campus that host events, she thinks it’s important for Student Housing to get exposure, not only for current students, but also potential students as well. “It would be easy to say, ‘Hey, we’ll just depend on everybody else to help people have fun,’” she said, “but I think the whole point is to build relationships. Knight said the purpose of having R.A.s on campus goes beyond the need for supervised hallways or enforced residential policies and guidelines. “They’re there to build relationships as well,” Knight said. In addition to events and socials, she said the R.A.s host educational programs throughout the semester. Knight also said the R.A.s benefit from hosting events. “Teamwork is the biggest thing they gain, but definitely that leadership experience of not having someone to plan things for them,” she said. Junior Resident Assistant and Accounting major Darius Morris said he’s going into his third year as an R.A., which is a result from the influence that one of his R.A.s had on him during his freshman year. He said that he wanted to take an active role in helping others students have the best college experience possible by being a positive role model like his R.A. He also said that his desire to help others has had a profound impact in his growth as a student and member of the community. He also said he thinks it’s important to host fun events like the Haunted House. Freshman Political Science major Greyson Basham said he attended the Haunted House for the first time with friends. “It was super fun,” he said. “I didn’t expect it to be as interactive as it was. With the stress caused by deadlines and homework, Basham said he appreciates opportunities to de-stress and relax. “It’s really nice to go to campus events and just sit and watch a movie, get some free popcorn, or play laser tag with your friends,” he said. For more information about Student Housing events, visit the housing office located in the Cameron Village.